Kintamani as a matter of fact is a village that sit on the rim of the huge Batur caldera about 1,500m above sea level but on tourist dictionary it refers to an area of north-eastern Bali which encompasses Penelokan, Toya Bungkah, Batur and Kintamani villages, Kintamani offers dramatic views of the active volcano Mount Batur and serene Lake Batur. Kintamani and Penelokan is sit on the rim of caldera while Toyo Bungkah village is located down down at the lake edge. Kintamani area, especially Penelokan village offers spectacular views of this crater lake and Mount Batur, set in a vast volcanic caldera. Photo opportunities abound, but try to be there as early in the morning as you can manage before the cloud inevitably starts to gather . Kintamani has adequate tourist accomadation and also a good base for those who want to climb and explore the Mount Batur area. 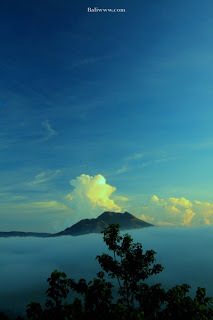 Kintamani’s temperature is usually about 15 degrees cooler than down on the coast, and even more so at night. That, coupled with the often cloudy and drizzly weather, makes a sweater or jacket advisable in the day time and vital after sunset.